We’d like to introduce Holly, the clever crafter behind the blog Our Holly Days. 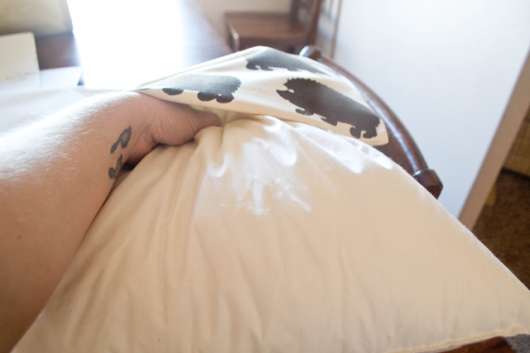 Holly loves DIY projects so she jumped at the chance to try our latest and greatest craft kit, Paint-A-Pillow. 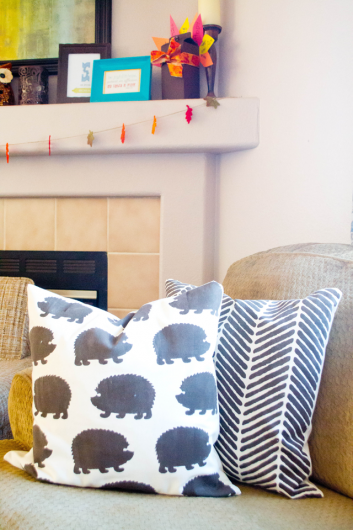 She’s in the process of giving her son’s room a makeover and fun accent pillows would be the perfect room accessory. 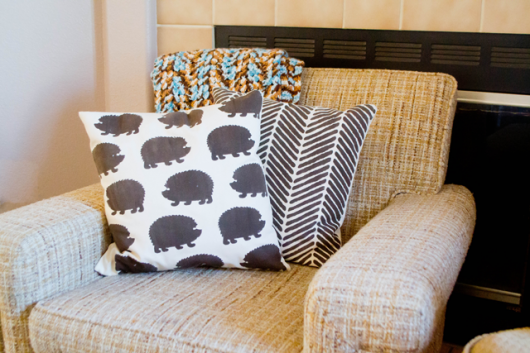 She ordered the Herringbone Stitch Paint-A-Pillow kit along with an extra pillow cover, the Hedgehog Stencil, and fabric paint in terre verte. We’re going to give you a quick glimpse at her stenciled accent pillows and then we’ll fill you in on how you can recreate the look! Do you love it or do you love it? Until the bedroom makeover is completed, these eye-catching cuties are hanging out in her living room. Ok, so here is how she crafted them. Holly ordered a Paint-A- Pillow kit which included everything she needed to make one accent pillow. Holly commented, “My Paint-A-Pillow kit (I ordered a Hedgehogs kit & a Herringbone kit) came with literally everything I needed to just pull it out of the box & start painting. That’s my kind of DIY!” Once her craft area was set up, Holly was ready to go. The first thing she did was make sure the pillow was lined up with the zipper label at the bottom. She poured her Jacquard fabric paint into a foam tray. 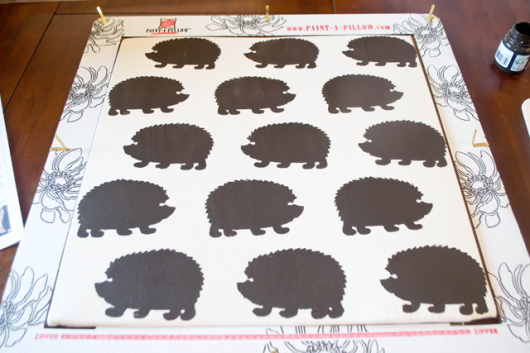 She used a dense foam roller to paint the fun hedgehog pattern. ** If you’re recreating this at home, be careful not to overload the roller with paint. Roll off the excess paint onto a folded paper towel until the roller looks almost dry. The key to stenciling is using as little paint as possible. Too much paint will cause the design to bleed and smudge. 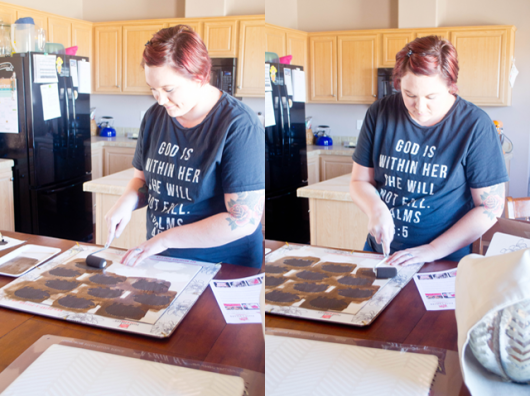 Once the entire pillow cover was painted, Holly peeled back the metal tabs holding the stencil in place and cleaned off the stencil in the sink. Then she was ready to paint her second pillow using the Herringbone Stitch stencil pattern. When the pillow covers were complete, Holly stuffed the inserts inside. Ready to see how it all turned out? Holly mentions that, ” Taking the time to paint, create, & do something that interests me was calming. Even with my kids home while I did it. Who knew painting a stencil could be so relaxing!” We’re happy to hear that she enjoyed making these. 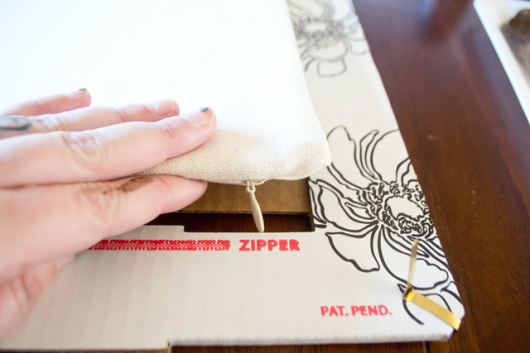 Want to win a free Paint-A-Pillow kit? Jump on over to Holly’s blog and enter her giveaway. 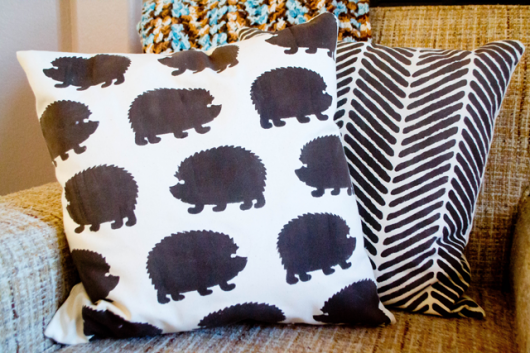 Tell us: Do you prefer the Hedgehog or Herringbone Stitch pattern? Leave us a comment below! Stenciled Stairs Worth Staring At!